A Sussex man has been banned from owning or having contact with animals after being caught on CCTV punching and kicking a dog in a pub garden. Daniel McCreedy, 33, of Campbell Road, Brighton, appeared before Brighton magistrates this afternoon (August 25) for sentencing, after a prosecution case brought by animal charity the RSPCA. 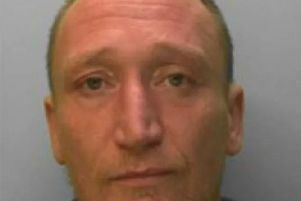 He pleaded guilty on August 11 to causing unnecessary suffering to a Staffordshire Bull Terrier called Babe (also known as Tyson), by subjecting the dog to unreasonable physical violence at the Royal Oak pub in Lewes on April 13. The court heard McCreedy was looking after the dog for a friend when he was captured in ‘disturbing’ CCTV footage at the pub. In a 20-minute video shown to the court, McCreedy was seen punching and kicking the dog, dragging him across the floor by his collar and pouring some of his pint of beer over the animal. Prosecutor David Buck said: “During the footage, one can see a number of incidents of aggression on behalf of the defendant towards the animal. He said the dog is then subject to a further nine blows to the head by McCreedy while it was under the table, as well as kicks to the groin area. McCreedy was in the pub for 40 minutes before being asked to leave. After the incident, pub staff watched the footage back, and then posted a short segment online in a bid to identify the man, and reported it to the police and RSPCA. When the owner of the dog was traced, the dog was examined by the RSPCA and a vet, and was found not to have significant injuries as a result of the abuse. The dog now remains in the care of its owner, who was said to be 'horrified' to discover what had happened to his dog. Martyn Williams, defending, said: “Mr McCreedy has asked me to express his genuine remorse and regret. He is genuinely appalled by his actions. Mr Williams said McCreedy had mental health issues, including ADHD, tourette’s, OCD and stress. “Looking after an animal causes him stress and is something he is totally incapable of doing,” Mr Williams said. He added that McCreedy has ‘constant involvement with social services’, and drug rehabilitation service Pavilions. Magistrate Michael Milne said: “The video is quite disturbing really. We have taken into account your early guilty plea, your remorse, and your mental health." McCreedy was spared a custodial sentence, but magistrates handed him a 12-month community order, 20 days of rehabilitation for mental health issues, a curfew from 8pm to 8am for seven days a week lasting eight weeks, £300 in costs to the RSPCA and an £85 court surcharge. He was also banned from owning or having contact with animals until further notice. McCreedy asked the judge 'if I am still allowed to feed the stray cats that come round every night', to which Mr Milne replied: "Did you not hear what I just said? You are not to have any contact whatsoever." RSPCA inspector Tony Woodley, who led the investigation said: “Watching this video is just heart-breaking and stomach churning. This dog is completely subordinate and this prolonged period of abuse is totally unwarranted and frankly disturbing. “The poor dog is just absolutely terrified and also confused, one minute McCreedy is hitting him repeatedly in the head, the next minute he is cuddling the dog in a bid to pretend he is a caring animal owner. It is just horrific to see and a vet who watched this said that in their opinion there is no doubt this dog was caused pain and suffering during this sustained attack. “It is perhaps lucky that the poor dog did not suffer any lasting physical injuries as a result of this attack, but he would clearly have been severely traumatised by McCreedy’s actions.